I am sure you would all agree that it would be wonderful to be able to sculpt something even close to this sculpture featured below.Unfortunately I'm a chocoholic not a chocolatier and I'm sure this would take many years of training and practice.Whilst I will probably never produce anything like this I realize that without even the basic knowledge of chocolate I would have even less of a chance.I even thought that some people may even be afraid to work with chocolate so I decided to write a post trying to help people understand a little bit more about chocolate hopefully inspiring people to create some chocolate desserts and cakes and well basically anything with chocolate in it. So whilst I can only aspire to create something like this sculpture I can carry on making some pretty nice chocolate dishes and I am sure you will be doing the same soon if not already. Store chocolate in a cool, dry place away from direct heat or sunlight. Most chocolate can be stored for about 1 year. It can be stored in the refrigerator, but make sure it is well wrapped as it will pick up flavours from other foods. Chocolate decorations can be stored in airtight containers and interleaved with non-stick baking parchment. Dark chocolate will keep for 4 weeks and milk and white chocolate for 2 weeks. Chocolate should not be melted over direct heat, except when melted with the other ingredients and even then the heat should be very low. Break the chocolate into small, equal-sized pieces and place them in a heatproof bowl. Place over a pan of hot water, making sure the base is not in contact with the water. Once the chocolate starts to melt, stir gently and if necessary leave over the water a little longer. No drops of water or steam should come into contact with the melted chocolate as it will solidify. To melt chocolate in the microwave, break the chocolate into small pieces and place in microwave-proof bowl. Timing will vary according to the type and quantity of chocolate. As a guide, melt 125 g/ 4 1/2 oz dark chocolate on High for 2 minutes and white or milk for 2-3 minutes on Medium. Stir the chocolate and leave to stand for a few minutes, then stir again. Return to the microwave for a further 30 seconds if necessary. Chocolate sets best at 65oF/ 18oC although it will set (more slowly) in a slightly hotter room. If possible set chocolate for decorations in a cool room. If set in the refrigerator it may develop a white bloom. Dark Chocolate can contain anything from 30% to 75% cocoa solids. It has a slightly sweet flavour and a dark colour. It is the chocolate most used for cooking. For everyday cooking and the majority of all recipes calling for dark chocolate, choose one with around 50% cocoa solids. However, dark chocolate with a higher cocoa solid content will give a richer more intense flavour. This chocolate is often called luxury or continental chocolate and has a cocoa solid content of between 70-75%. Occasionally it is essential to use a better chocolate and I have indicated in the individual recipes where this is the case. Milk Chocolate, as it's name suggests, contains milk and has a lovely creamy, mild and sweet flavour. It is mostly used as an eating chocolate, rather than cooking. However it does have it's place in chocolate cookery, especially for decorations and when a milder, creamy flavour is required. It is more sensitive to heat than dark chocolate so care must be taken when melting it. White Chocolate contains a lower cocoa butter content and cocoa solids. It can be quite temperamental when used in cooking. Always choose a luxury cooking white chocolate to avoid problems and take great care not to overheat when melting. 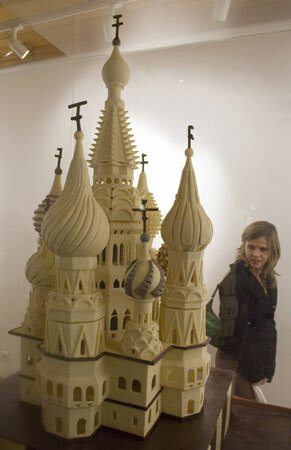 White chocolate is useful for colour contrast especially when decorating cakes. Couverture, although this is the preffered chocolate for professionals (it retains a high gloss after melting and cooling) it requires tempering and is only available from specialist suppliers. Chocolate-flavoured Cake Covering is an inferior product not generally used by true chocolate lovers. However it has a higher fat content making it easier to handle when making some decorations, such as curls or caraque. If you do not want to compromise the flavour too much, but have difficulty making the decorations with pure chocolate, try adding a few squares of chocolate-flavoured cake covering to a good quality chocolate. Chocolate chips are available in dark, milk and white chocolate varieties and are used for baking and decoration. Cocoa powder is the powder left after the cocoa butter has been pressed from the roasted and ground beans. It is unsweetened and bitter in flavour. It gives a good, strong chocolate flavour when used in cooking. When using dark chocolate always buy the most expensive you can afford with 70% cocoa solids or more for a more intense flavour and greater health benefits. Reduces risk of colon cancer : Cocoa polyphenols from dark chocolate reduce the risk of colorectal cancer. This was determined in a study by the Science and Technology Institute of Food and Nutrition in Spain, which was published in the journal Molecular Nutrition. What an amazing sculpture! Bit of a waste of perfectly good chocolate though! If this was dark chocolate I would say yes milk chocolate maybe white chocolate no,Like you say "what a amazing sculpture". And I think it will probably be eaten close to it's sell by date. Just imagine filling the gaps with some nice dark chocolate mousse and some berries yum yum. White chocolate has always puzzled me. Dark and milk chocolate chips and bars have the same ingredients. However, I find that the same brand of white chocolate bars and chips to have different ingredients and therefore do not perform the same. Not sure why they would vary the recipe. Anyhow this was an informative post and I love the sculpture photo! It used to puzzle me too,white chocolate has none of the health benefits of dark chocolate or even milk chocolate and the taste is completely different.I am glad that my post was informative to a experienced foodie like you,and yes people vary recipes all the time not always for the good. That sculpture is amazing. At the moment I'm aspiring to just learning to temper chocolate properly - three years in the planning, but still haven't managed it. Good to discover another chocoholic's blog. Thanks for following my blog it is good to have someone of your blogging experience on board,and another chocoholic.Tempering chocolate is a art or skill in it self,stick with it I'm sure you will get there practice makes perfect as they say,oh yes this is a great sculpture. Whoa... the sculpture definitely caught my attention! Amazing!!!! I always enjoy chocolate yet I wasn't familiar with everything about chocolate. =P This is a great post to remember. I got to pin this.